3M is well-known by most as the people that bring the world Post-It Notes and Scotch Tape. The truth is that they play a far bigger role in our world, from autonomous cars to bike frames to granules in shingles that are cooling our world. You are never more than 10 feet from a 3M product. When tasked with bringing to life their first brand campaign in a decade, we focused on the thing that brings all of their products, innovation and impact to life — wonder. Wonder is the human-focused beginning of an idea, the act of asking what-if? The campaign was focused around 4 videos. In each one the goal was to uncover 3M's role in our world, ranging from more familiar places to ones that pushed our audience's expectations. Video storytelling was central to this campaign. Each video contained questions about ways in which 3M products and innovation affected our world. 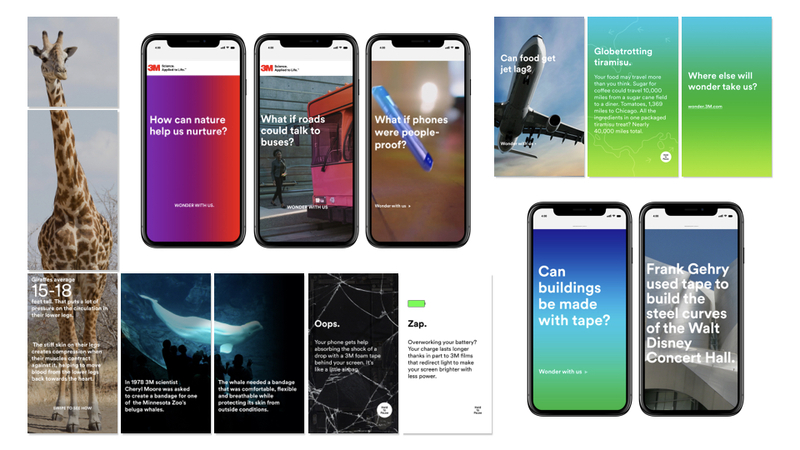 Through distributed content across social as well as a campaign website, we focused on bringing our audience the answers to these question as a means to explore how these products are shaping our world.